Happy 4th of July to Americans today! I’ve been wearing the Ohm Beads Dirty Twisted Bangle for a few days now and really, really like it. It’s the same oval shape as the regular Twisted Bangle which I’ve had for some time and it’s super comfortable. I wear it a lot with no beads actually. 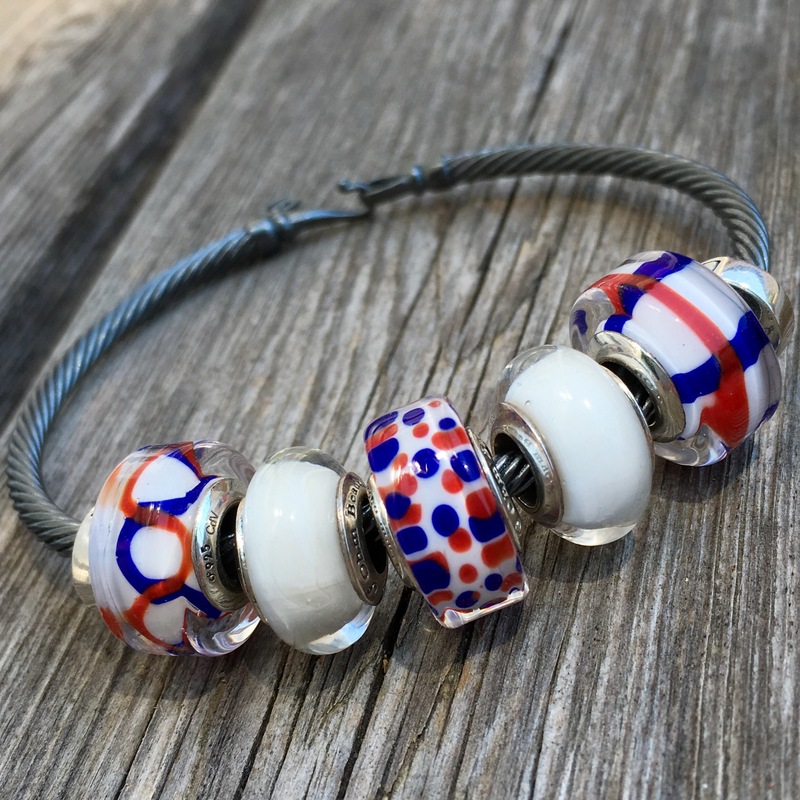 The Dirty Twisted Bangle makes beads really ‘pop’. Check out the True Beadz in the Linen shade against the dark grey of the bangle. 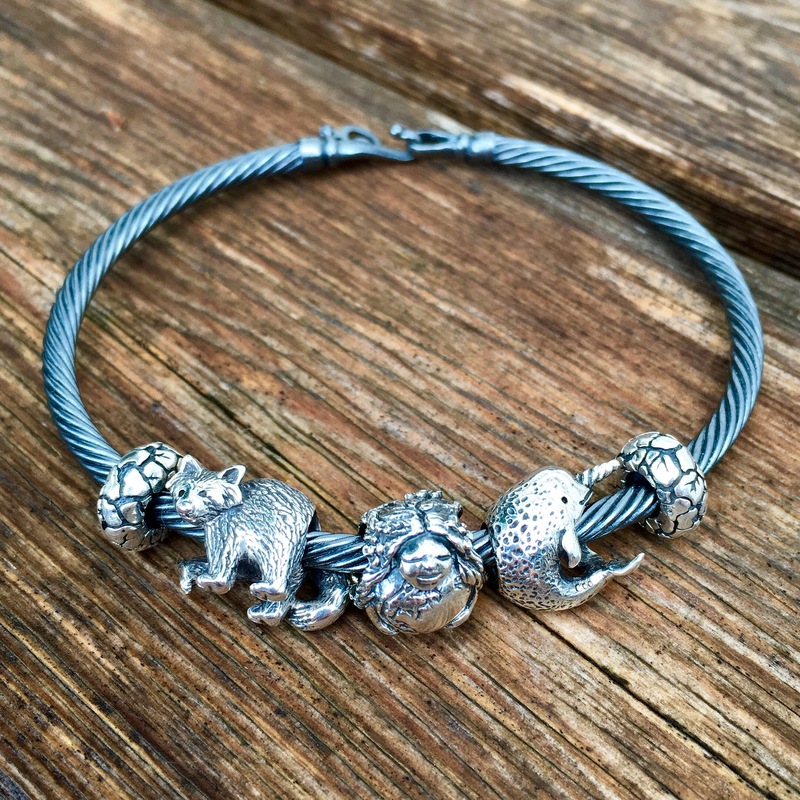 Silver beads look great on it, with Mama Terra guarding her Red Panda and Narwhal. The Ohm Beads Courage and Loyalty set works well, too. And I love the Baby Pink shade from True Beadz on it. I’m afraid I have no idea how it will wear as this is the first heavily oxidized product of any brand that I’ve had. I did wear it golfing in 30 degree weather (sunscreen and sweat abound) and didn’t notice anything unusual. I really look forward to trying different beads on it as well as wearing it plain. Pandora beads will fit on it but Trollbeads will not, in case anyone is wondering. This concludes the Ohm Beads promotion long weekend and I’ll probably move back to a Mon/Wed/Fri format for a bit. Coming up will be some more blog posts with True Beadz, Ohm Beads’ Hug Me, safety chains and barring any postal disruption from Canada Post I’ll be showing the Grumpy Cat beads, Caramel Latte and something new to me, Soleil Beads. So, here is the last promotion for long weekend. 10% OFF anything storewide on ohmbeads.com. Fine print: To take advantage of this promotion use promo code JULY1610OFF on the last page of checkout (after payment). This promo is available on ohmbeads.com only. All sales are final. No substitutions may be made. Promotions may not be combined. Sale starts on July 4th at 1AM Seattle Time and ends at July 4th 11PM PDT. I really like the True Beadz Linen beads on the bracelet and the final baby pink combination is my favourite. 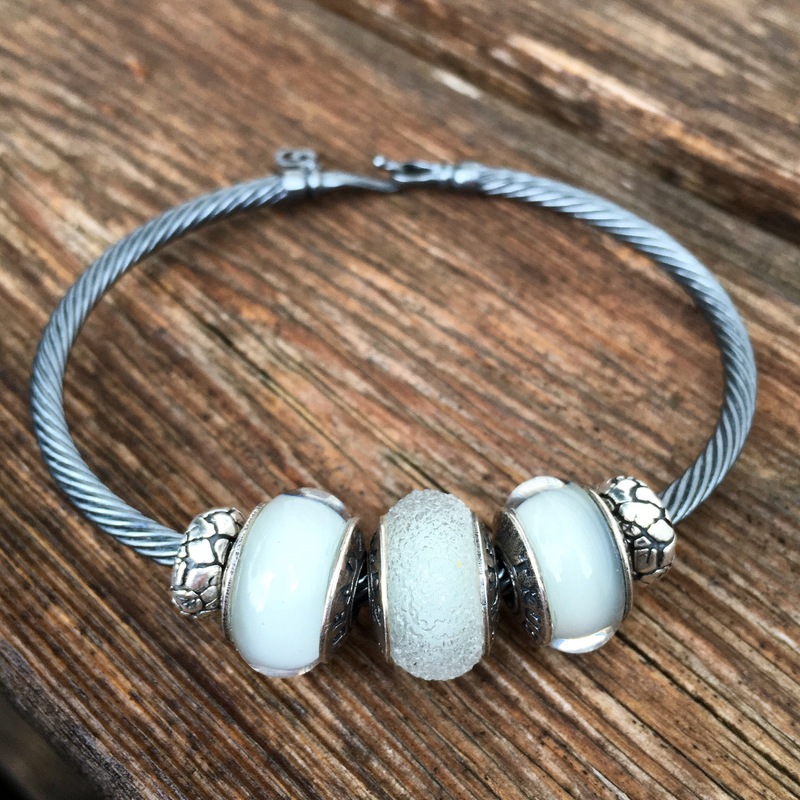 My first Pandora bracelet was the oxidised one and it did fade over the course of a year, but when they do fade, if you don’t like the shiny, pewter appearance, it can be taken to a jeweller and they will re-oxidise it for you. I am very tempted by this bracelet, Martha. 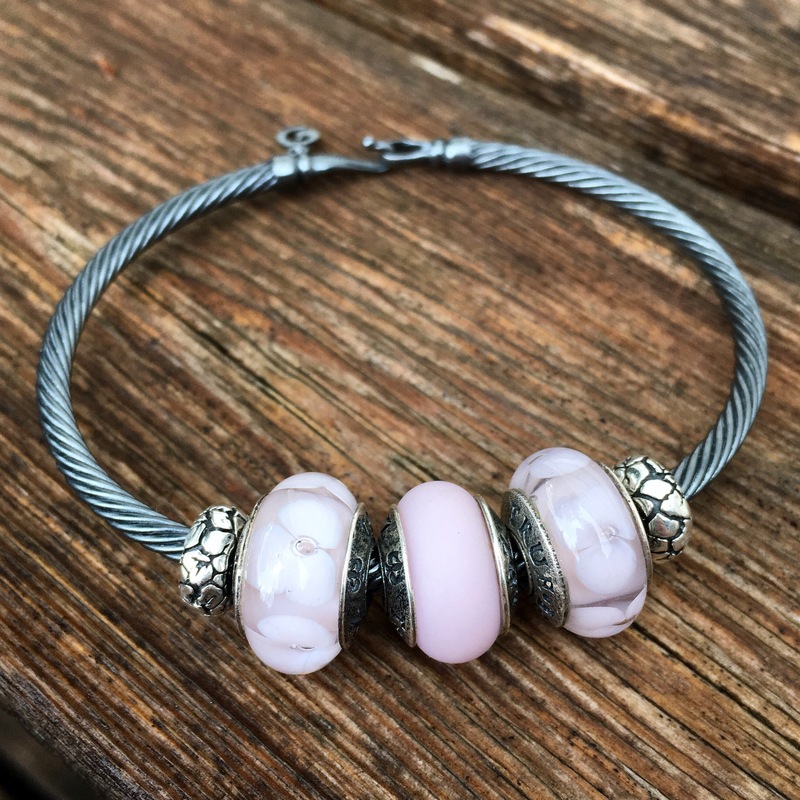 I absolutely love the pale pink beads on it too, but I’ve always been partial to pink and grey. I will keep an eye on the bangle to see if it fades, but to tell the truth, I also like the sound of a pewter look. I will bring it with me next week when we meet up. I can’t remember if you tried on my Twisted Bangle before. Thanks for this info, Sarah! I love the look of this bangle. I think the darkness makes it really stand out. I would imagine most coloured glass would really be striking against it. Yes, I do look forward to try some different beads with it. I think it would be striking in the winter with silver and white beads. Thanks so much for this review! It’s definitely a must buy for me now. And great lakes boutique is having a promo today too if you spend $125 you get one free (US) so this worked out perfectly!!! I appreciate your photography so much, I don’t know how I ever bought online without it!?! I love my oxidized Pandora bracelets, they have stayed dark for over 2 years now. I’ve been waiting for someone to make a bangle, I’m glad it was Ohm, their’s I think is the most comfortable. That’s super, Mandy! I’m glad I could be of help and I’m happy you can get one on a promo! I think the sizes are true to the cm recommendations. I wear a 20cm bracelet so that’s a M Ohm bangle and S Troll bangle, M leather Troll.